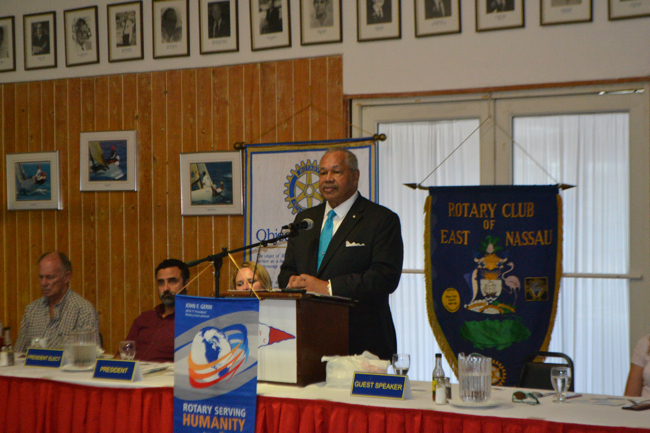 College of The Bahamas President Rodney D. Smith addresses members of the Rotary Club of East Nassau at the Nassau Yacht Club. Nassau, BAHAMAS – In academics, research and skills development, the College of The Bahamas and its coming successor, the University of The Bahamas, will continue to leave a distinct footprint throughout The Bahamas, according to President Dr. Rodney D. Smith. Dr. Smith recently shared his vision for academic and operational growth with members of the Rotary Club of East Nassau. Envisioned more than 40 years ago, the University’s official Charter Day will be November 10th, 2016. However, outside of the formal events that are being planned to commemorate its establishment, critical capacity development work is underway to place the goal of higher education within the reach of Bahamians throughout the archipelago. The linchpin for success, in addition to the University’s campuses in New Providence, will be the creation of centres of excellence in the Family Islands. “So rather than having all of our centres of excellence on one island we are going to be creating centres of excellence on several islands of the country,” President Smith shared. Currently, approximately 5,000 students are enrolled in the College of The Bahamas. An expanding platform of distance education under University of The Bahamas is anticipated to augment enrolment capacity nationally, regionally and internationally. Key to that plan is the University’s attainment of accreditation under the U.S.-based Southern Association of Colleges and Schools (SACS). It is one of the six regional accreditation organizations recognized by the United States Department of Education and the Council for Higher Education Accreditation. 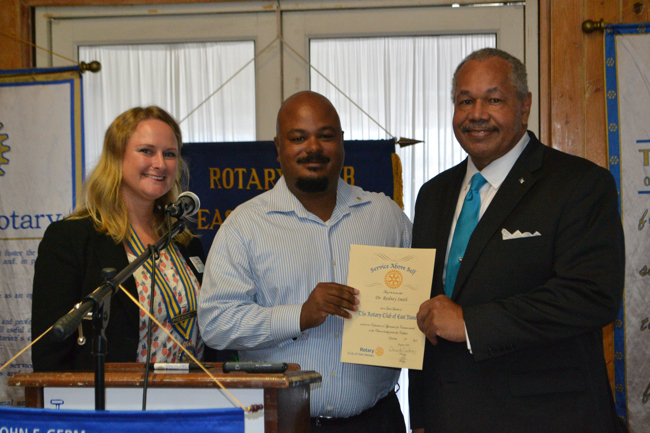 College of The Bahamas President Rodney Dr. Smith (at right) accepts a certificate of appreciation from members of the Rotary Club of East Nassau. The University of The Bahamas Act passed by both the House of Assembly and the Senate in the summer of 2016 contains the core governance requirements necessary for SACS accreditation. The Act also reflects a more inclusive model of governance where stakeholders in academia and the public and private sector are broadly represented. With the establishment of an Academic Senate, the faculty will assume greater responsibility for the curriculum of the institution. “[SACS] is the most stringent accreditation in the world so much so that institutions in China as well as South America are seeking the same SACS accreditation,” Dr. Smith explained. “It is strategic that we are doing this because we intend to become an international University of The Bahamas and that means that once we complete the SACS accreditation we will be able to complete the paperwork for any accreditation agency anywhere in the world including in the UK and Canada and become an internationally accredited university,” he added. Increasing capacity to house students and faculty from abroad also plays a critical role in achieving that objective. Currently, plans are underway to begin construction on a new multi-purpose residential facility at the Oakes Field Campus in New Providence. This venture is anticipated to emanate through a public-private partnership, with a groundbreaking ceremony expected to occur during Fall 2016. During the Fall 2016 semester, construction will also be completed on a new residence facility at the Northern Bahamas Campus in Grand Bahama, funded by a $3 million donation from the Grand Bahama Port Authority, one of The College’s long-standing donors.Building and solidifying relationships with donors, friends and alumni remains a key priority for the institution, especially as it seeks to augment private funding in support of university goals and objectives. “We will continue to receive some government subvention over the years as we move along but the long-term goal is the create a University of The Bahamas that has its own revenue source, its own endowment, significant endowment, and has its own fundraising mechanisms in place. We are creating the University of The Bahamas foundation not only locally but also in the United States for donations and 501(c)(3) clarifications as well,” President Smith noted. According to Dr. Smith, overall the institution will be guided by the national vision for growth, so much so that in the coming year the new Strategic Plan for the University of The Bahamas will be guided by the National Development Plan that is being crafted for The Bahamas. The University intends to create a Government and Public Policy Institute which will be responsible for creating national economic feasibility studies as well as monitoring the implementation of the National Development Plan using key performance indicators.